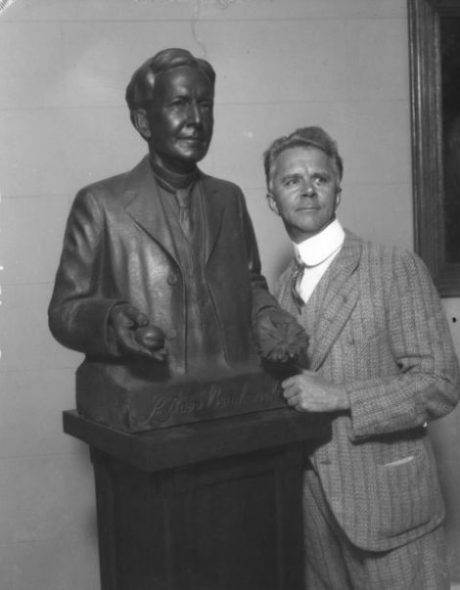 The noted sculptor, Roger Noble Burnham, may not be a familiar name, but if you attended the University of Southern California, or are a fan of silent film star Rudolph Valentino, you are aware of his more famous works. 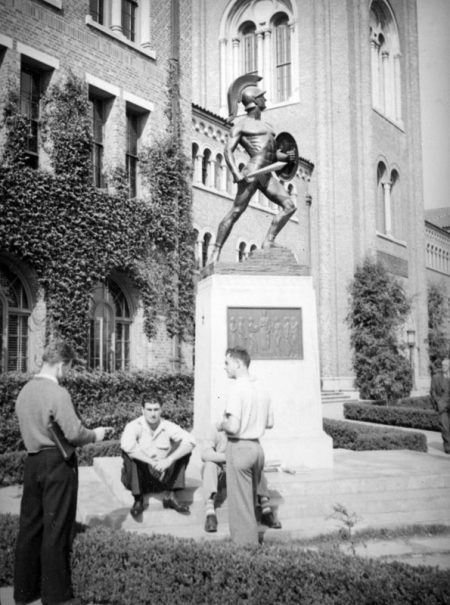 Burnham created the well-known “Tommy Trojan,” the most popular unofficial mascot at USC. 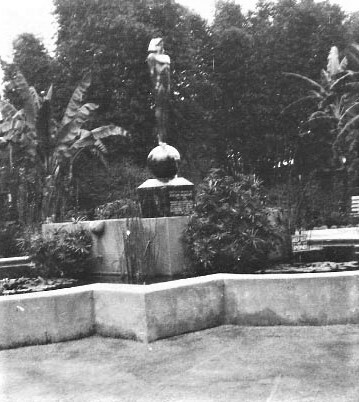 The following year, he was commissioned to create “Aspiration,” a memorial to the late Rudolph Valentino at Hollywood’s De Longpre Park. Burnham’s “Aspiration” — a tribute to silent film star Rudolph Valentino at De Longpre Park. 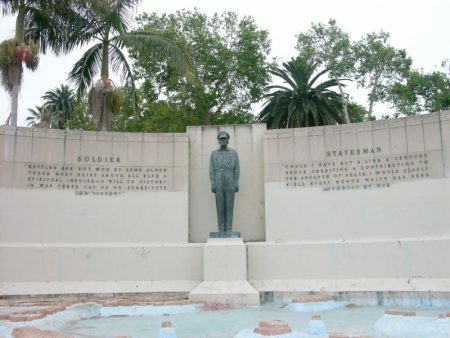 Other of Burnham’s works include the 12-foot bronze statue of Gen. MacArthur in McArthur Park; “The Spirit of ‘98” at the Los Angeles National Cemetery; the Scholarship Medal for the University of California, and he was a collaborator on the Astronomer’s Monument which stands in front of the Griffith Observatory. Burnham was born in Hingham, Massachusetts on August 8, 1876. With a Harvard degree in art history and architecture, he attended the American Academy of Dramatic Arts and toured with a theatrical company. Afterward, he studied sculpture with Caroline Hunt Rimmer, taught modeling at Harvard’s School of Architecture, and spent time in Rome and Hawaii before arriving moving to Los Angeles in 1925. There, he taught at Otis Art Institute until 1932. In addition, Burnham, a religious man, designed Christmas displays for the windows of a downtown department store. The statue would depict a benevolent Christ with out swept arms and a gentle smile, standing 150 feet tall on a quarter-sphere 60 feet high—equivalent to a 19-story building. It would be finished in fused gold and cost about $250,000. To pay for his dream, Burnham spoke at local churches and planned to sell replicas of several sizes of his statue across the country. 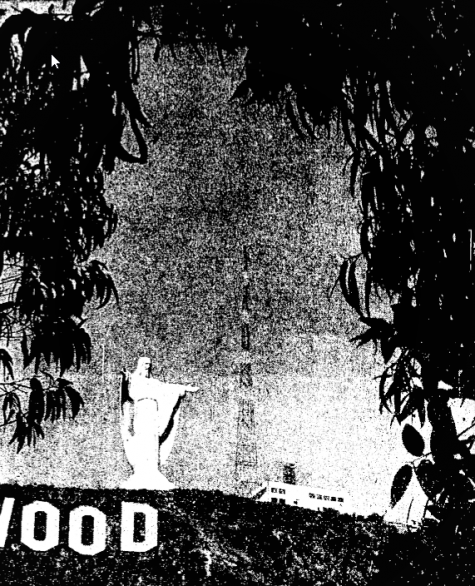 To envision his dream, in May 1951, the Los Angeles Times created a composite photo of the planned messianic statue. Sadly, for Burnham, his dream was never realized. Roger Noble Burnham lived another decade and died in Los Angeles on March 14, 1962 at age 85.